A week ago, I reported the CDC switched from nuclear war to flu as epidemic declared just before false alarm in Hawaii. 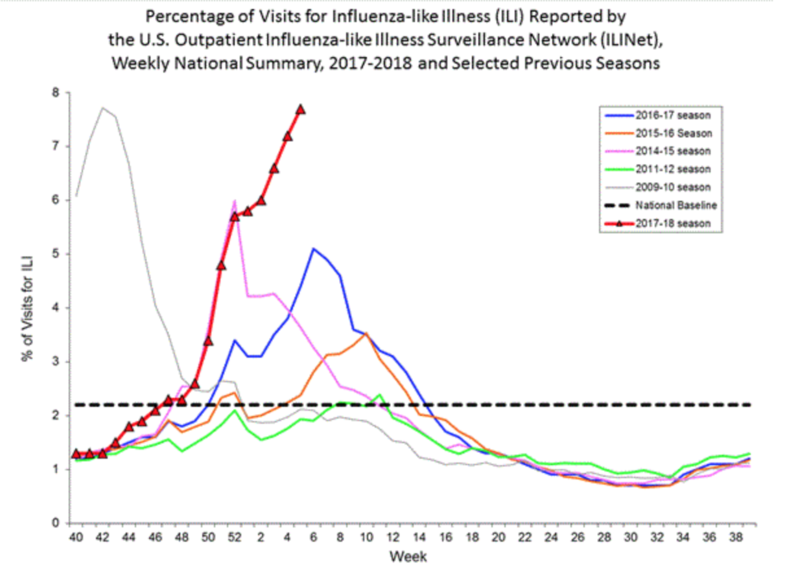 This month, the number of flu cases reached the peak of the 2009-2010 Swine Flu epidemic, which means this is the worst flu outbreak in the U.S. since I started writing this blog in 2011. No wonder the CDC switched from nuclear detonation to flu! I have four videos about the outbreak to share with my readers. The first is This flu season could be worst in a decade from CBS News, which has the best headline and states all the important facts. The CDC said Friday one in 10 deaths in the U.S. is currently caused by the flu or pneumonia. It's already one of the worst seasons on record, and it may not peak for several weeks. CBS News chief medical correspondent Dr. Jon LaPook reports. The acting director of the CDC appears again in the next video, A Pediatrician’s Tips On Protecting Your Family From Flu from NBC Nightly News. 63 children have died this season, compared to 20 within the same period last year. The CDC says at the current rate 34 million Americans will get the flu this season. One pediatrician shares secrets on how to stop the spread at home. I wouldn't be surprised if more than 60,000 Americans die and one million are hospitalized when this epidemic is over in May. Also, this flu season will likely have lasting effects on how Americans stifle sneezes. The response to the 2009-2010 Swine Flu epidemic included teaching people to sneeze into their sleeves. This one will teach people to sneeze into their shirts, too. Flu victim Gabriella Chabot figured prominently in both of the above reports. CBS Los Angeles posted a KCAL segment on her memorial yesterday, Friends, Parents Attend Touching Vigil For Teen Killed By Flu. Gabriella Chabot would have turned 15 next week. Tonight, people who knew her tried to come to grips with her loss. Tom Wait reports. My father ran a business in Thousand Oaks when I was kid and I would go to his office with him on weekends, so this story hits close to home, literally. Also, this is the first time I've labeled a post with obituary, pandemics, and kids. I hope I don't have to do that again; the combination hurts. I conclude by providing the local perspective with WXYZ's latest report on the outbreak, Metro Detroit suffering under harsh flu season as weeks still remain. The deadly flu epidemic isn’t easing up anytime soon. Several more deaths have been reported in just the last few days including a White Lake man and a 12-year-old boy here in Michigan. This segment had even more useful statistics, even though they did not include the latest ten pediatric deaths. Enough about flu for now. Tomorrow will be an entertainment entry. Since sports counts as entertainment, I might post something about the Winter Olympics. Stay tuned. I would say this is a combination of anti-vaxx nonsense and the massive emotional stress of the past year. As well as a virus that mutated between the selection of the strain that went into this season's vaccine and its availability. Happy Year of the Earth Dog!